No doubt, mercury is a threat to human health. Yet more than 2/3 of all dentists still use it on occasion. One thing that can make it easier to justify is a consequence of that that doctor/dentist division I wrote about a couple weeks ago: the tendency to treat teeth as though they were separate from the rest of the body. If that were true, it would seem impossible that mercury fillings could harm other organs, such as the brain. But of course they can. And do. The mouth/body split also supports more benign ideas, like the belief that brushing and flossing are enough to ensure healthy, disease-free teeth and gums. They’re important, of course – but so are nutrition, exercise, limited or no drug use (including tobacco and alcohol) and the rest. For all the things you do to keep your body healthy help keep your teeth and gums healthy, too. And vice versa. And just as keeping your body clean is one part of preventing illness – for instance, washing your hands after using the toilet – keeping your teeth clean is one part of preventing oral disease. Recently, a pair of Swedish studies made the news for one startling fact they found: 90% of Swedes don’t brush their teeth effectively. I imagine US results would be similar. Most Swedes regularly brush their teeth with fluoride toothpaste. But only few know the best brushing technique, how the toothpaste should be used and how fluoride prevents tooth decay. Of course, even scientists aren’t entirely sure how fluoride works. We do know it does little to remove biofilm (the colonies of pathogenic microbes, or “bad bugs,” we call “plaque”). In fact, at least one study has shown that non-fluoride toothpaste is actually more effective at removing biofilm than toothpaste with fluoride. What matters most is the mechanical action of brushing. Toothpaste provides grit to help remove the sticky biofilm. 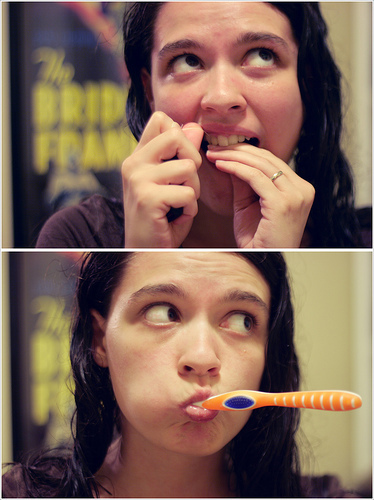 So how to brush your teeth effectively? First, despite what you’ve likely been told, you shouldn’t brush your teeth immediately after eating. Instead, wait a half hour or so – especially after acidic foods and beverages, which include those with a lot of sugar or other refined carbs. This gives oral conditions time to return to their usual alkaline state. Otherwise, you’re essentially brushing acids into your teeth, raising the risk of damaging the enamel, which in turn can lead to tooth sensitivity and decay. Then, when you do brush, follow the technique shown and described here.